Infants like to look at things that are new and surprising, and infants’ looking behaviour can tell us a lot about how babies learn and what they remember. Lots of the studies that are going on the lab right now involve showing infants pictures and recording where they look using our eye-tracking equipment. The eye-tracker looks like any other computer monitor, but it has a set of infra-red cameras embedded in the edges. 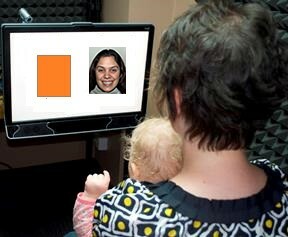 We ask babies to sit on their parent’s lap in front of the eye-tracker and we begin the session by showing them a series of animations that appear at different places on the screen. Once this is done, the eye-tracker will track exactly where on the screen babies are looking. Other times, we track where babies are looking while we show them objects that are presented in a particular spatial configuration during learning and then switch position at test. If infants look for longer at the two items that have swapped positions in the image on the right during the test phase then it suggests that they have noticed the change of position of the two objects.These studies have shown that infants as young as 6 months can learn about “this goes with that” associations, picking out (with their eyes) which faces matches a background test scene very quickly. Have a read of this blog post if you would like to know more about what we have learnt using the eye tracker.